A patron saint for handguns? When a new pope gets elected later this month, one of the many decisions he will face is whether to grant official recognition to anoint a Patron Saint of Handgunners. The candidate is Saint Gabriel Possenti, a 19th century Italian monk who allegedly saved a village from bandits with a handgun before dying of tuberculosis at 23. According to the group, Saint Gabriel Possenti saved the villagers of Isola del Gran Sasso from a marauding gang of 20 renegade soldiers by demonstrating his marksmanship with a revolver in 1860. When the gangsters (whom the group notes were also “would-be rapists”) descended on the town, Possenti fired at a lizard in the road and killed it with a single shot. The bandits, terrified by his excellent shot, fled the town and the day was saved. “St. Gabriel Possenti performed this feat of courage without causing physical harm to a single human being,” they note. The legend, however, may be little more than that, as some allege the gun incident never occurred. One website dedicated to the saint notes that the tale only appears in one of the four biographies on Possenti, and that the author of the relevant one, Rev. Godfrey Poage, acknowledged that “some of the accounts in his book were invented to ‘enliven’ the story.” Furthermore, Possenti died only two years later and thus would likely have been in late stages of tuberculosis, the critics note, and thus in no shape to fight off 20 armed gangsters. "The Poage account of the lizard incident remained non-controversial for over a quarter of a century. 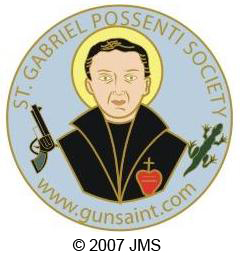 It wasn't until I began promoting St. Gabriel Possenti as a Patron of Handgunners in the late 1980s that anti-gun bigots began a belated attempt to attack the account of the lizard incident. It seems they are more concerned with being politically correct than historically accurate,” Snyder said. Snyder wrote a whole book about the incident, "Gun Saint," which features an illustration of the young Saint Gabriel Possenti firing a gun as bearded gangsters flee in all directions. The group even claims biblical passages support the use of guns for self-defense. You can read about them in a printed monograph, which the Society will send to you for a reasonable contribution of $10.